Wow. I can’t believe March is here and it’s been almost a month since I posted anything on my blog. I apologize to those of you who have been looking for new recipes! I spent all of January’s and most of February’s “blog time” doing the one thing I dread most. The 4 or 5 hours a week I was spending on writing and creating recipes and blog posts has been used for exercising. Then, for the last two weeks, all of my spare time has been spent remodeling two bathrooms (paint, tile floor, baseboards, new wall hangings, etc.). I’m trying to get back into my morning exercise routine, yet the winter doldrums keep dragging me down. But, spring is coming and that means gardening, fresh vegetables, and a whole new outlook on what to make for dinner. Plus, I finally got my new stove so now I have an oven that works! I promise you, new recipes are coming! Maybe you already know this, but yesterday would have been the 107th birthday of Dr. Seuss, the amazing author of children’s classics such as Green Eggs & Ham and The Cat in the Hat, among hundreds of other stories. Dr. Seuss is a big hit in our house. All of my kids have enjoyed his crazy, rhyming stories as they’ve learned to read. As they headed off to school yesterday, one of them mentioned it was Dr. Seuss’ birthday. That got me thinking…about something fun for dinner. Yep, I did it — I made green eggs and ham for dinner. The eggs were fresh from our local farmer (I waited in the car for him to gather the eggs from the barn yesterday). I simply whisked them for scrambled eggs and added a squeeze of green food coloring. I still haven’t found a local source for ham, so it was not exactly *happy* ham, but it was nitrate and nitrite free and minimally processed, so I included a small amount for my omnivore boys. I made Whoville Taters (cubed potatoes, tossed in olive oil, seasoned, and roasted in the oven) and Starbellied Sneetch toast. For dessert? Some Cat in the Hat yogurt parfaits! I simply took vanilla yogurt (made with coconut milk) and mixed half of it with thawed frozen raspberries and some stevia. I mixed the other half with a little coconut extract and chopped ripe bananas. Then I alternated layers of the two yogurts to look like the stripes on The Cat in the Hat’s hat. The effect would have been better if I had tall, skinny glasses, but I used what I had and I didn’t hear any complaints! It was a fun dinner and led to Brady running upstairs and digging out ALL of the Dr. Seuss books to read before bed last night. We didn’t make it through all of them, of course, but it was a great way to celebrate such an important birthday! I’m feeling a bit spicy today! I’ve had these two cans of coconut milk in my pantry for about a year, just waiting for me to be inspired to use them. I also have a truckload of lentils in my pantry. Today, I decided to try my hand at curried lentils. I think I’ve made a curry-based dish maybe once in my life, so this was truly a new experience. Most of the recipes I’ve seen have so many ingredients! I wanted something simple and quick to put together (hey, my life is crazy!). I made the first batch using some little greenish-black lentils that my mom gave me. The end result had fantastic flavor and was fairly spicy, BUT — when the dark-colored lentils cooked with the coconut milk, the finished dish was an unappetizing grayish-green color. Now, I’ve used these same lentils in soups and not had a problem with the color. I guess it’s because my soups are generally full of colorful vegetables so you don’t notice the color of the lentils. I decided to make a second batch of curried lentils using some light-colored lentils I also had in my pantry. They are bigger and took a little longer to cook, but the finished dish was equally as delicious and the color was a nice golden brown. Served over Israeli couscous with a side of flatbread, it was the perfect lunch. Well, maybe not perfect. Canned coconut milk is high in fat, so I wouldn’t make this an everyday lunch, but it was a nice change from the usual. Oh, by the way, I have no idea if this is close to authentic or traditional curried lentils, so forgive me if it’s not. I just put it together based on what I had read and what I thought would go well together. I really like the spiciness of the dish, so it will go into my permanent recipe binder. Heat olive oil in a medium saucepan over medium-high heat. Add carrots, onions and garlic and saute for 2 to 3 minutes. Stir in curry powder, ginger and cayenne and cook for a minute or two. Stir in lentils, broth (or water) and coconut milk. Bring to a boil. Reduce heat, cover and simmer until lentils are tender, but not mushy, and some liquid remains (about 30 minutes). Season to taste with salt and pepper. To serve, divide couscous or rice between four plates. Top with curried lentils mixture and some of the liquid, dividing evenly. Garnish with minced cilantro. Enjoy! Update: While doing some grocery shopping this evening, I came across two different brands of “lite” coconut milk. Might be the way to go if you’re watching your fat intake. Thanks for the tip, Jane! I was really craving something chocolate the other day, but was not in the mood to bake anything. I started experimenting with those no-bake cookies that are made with oats and cocoa powder. I came up with a vegan version that really hit the spot (recipe below). After I ate two (ok, maybe it was three) cookies, I decided to do a little online research on cocoa to see if it has any affect on blood pressure. I am pleased to report that it happens to be very good for your blood pressure! I'm sure you've probably heard the word antioxidants. Antioxidants help your body fight off the damage caused by free radicals. Some of the foods high in antioxidants are blueberries, blackberries, green and black tea, red wine and chocolate. Specifically, dark chocolate and unsweetened cocoa powder. As a matter of fact, scientists at Cornell University found that cocoa powder has almost twice the antioxidants found in red wine and nearly three times the antioxidants in green tea. Two recent studies tested cocoa and dark chocolate consumption in people with hypertension. After just two weeks, both studies found similar results: both systolic and diastolic blood pressure were reduced! How does it work? The antioxidants in cocoa "protect the heart and circulatory system," reports the Journal of Clinical Nutrition. Apparently, eating a few squares of dark chocolate a day will increase your blood vessels' ability to dilate. This is called vasodilation, which I discussed in an earlier blog post. Vasodilation relaxes your blood vessels which eases blood pressure. Another study shows that the antioxidants in cocoa (flavonoids) help the body produce more nitric oxide which relaxes the blood vessels, thus lowering blood pressure. But, wait! There's more. Cocoa is a good source of magnesium, calcium, potassium and manganese, which are vital minerals in lowering blood pressure. If all that's not enough to convince you, make note of this: cocoa also may have anti-aging and anti-inflammatory properties. And, it's been reported that the antioxidants in cocoa can lower LDL cholesterol. By the way, I'm not talking about candy bars and chocolate ice cream. Sorry! Unsweetened cocoa and dark chocolate bars are the specific items. And check the ingredients when purchasing dark chocolate, if you're vegan. Many contain dairy products. Unsweetened cocoa powder is vegan and is often used in baked goods. You can also make hot chocolate with it. The directions are on the back of the box of cocoa powder. 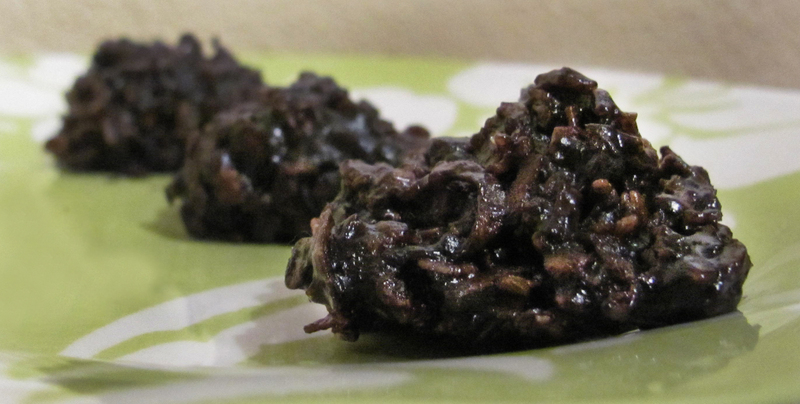 In the meantime, whip up a batch of these yummy vegan no-bake cookies. They aren't the most photogenic cookies in the world but, man, they are tasty! Lay a large sheet of wax paper on a large cookie sheet. In a medium saucepan, melt butter over medium-high heat. Stir in coconut milk. Then add sugars, cocoa powder and salt. Whisk together. Bring to a rolling boil. As soon as it comes to a rolling boil, watch the clock and allow it to boil for 1 to 1-1/2 minutes. Stir in the peanut butter. Remove from heat and add oats and coconut. Stir well. Quickly drop by tablespoons onto wax paper-lined cookie sheet. Slide into refrigerator to chill. Enjoy! Note: Pay attention to how long you boil the cocoa mixture. I boiled for just one minute and my cookies are still a little bit sticky. But if you boil for too long, they will be really crumbly when chilled. I think next time I'll try a minute and a half. Just home from an afternoon/evening of “health food” shopping. I stopped into the Phoenix Earth Food Co-op in Toledo to see what vegan goodies I could find. Pretty much the same things as the other health food stores in Toledo. I will definitely go back, though. The people there are very nice and helpful. Then, I picked the kids up from school and headed straight up to Ann Arbor for some shopping at Whole Foods. I haven’t been there in a couple of years. I had forgotten how overwhelming it is. Everything there is beautiful, fresh and fabulous looking — and you wish you could just buy everything. The kids were amazed and intrigued and excited about picking out some healthy treats to take home. Plus, they had “tasters” all over the store, a child’s dream. My goal was to put together a list of things I would regularly buy there and try to go maybe every other month for a big trip. It didn’t quite go that way. I did not buy meat, cheese or produce (except for a pomegranate). I can get all of those things locally and support the businesses here. I also didn’t see anything I absolutely had to have, or the things I was interested in were too expensive. So what did I get? Mostly stuff the kids had to have! Some yummy Orange/Peach/Mango juice, almond milk (on sale), 2 bags of chips, 2 boxes of NutThins crackers (on sale), some dairy-free ice cream sandwiches, coconut freezer bars (which I assumed were dairy free and they aren’t…you know what they say about assuming! ), 2 new flavors of Izze, a pomegranate (kids choice), organic cheesy crackers, a bag of non-dairy cheese (not pictured), and a 4-pack of vegan chipotle “sausage” that was much cheaper than I’ve seen anywhere in Toledo. I also let the kids pick stuff from the bulk bins (not pictured). We came home with yogurt-covered raisins, organic chocolate malt balls, figs, and instant black bean dip. But my favorite of all the items here is the coffee creamer. It’s non-dairy and it’s not soy! It’s made from coconut milk and it is SO DELICIOUS. Yes, they definitely named the product right. I bought the regular flavored one at The Phoenix in Toledo, but Whole Foods had it in French Vanilla, so I bought two of them! All-in-all a fun trip despite being mostly treats. The bad news is I spent $80 and I don’t think I bought anything I can use for dinner this week, yet I spent most of my weekly food budget. This week’s meals will just have to come from things in the freezer and pantry and I’ll spend the rest of my budget on fruits and vegetables. For now, I’m off to get kids to bed and collapse in the recliner with a cup of decaf and my latest library books, Moosewood Restaurant: Cooking for Health and Vegan Cupcakes Take Over The World. Great day for a steaming bowl of soup. So we got pounded with snow yesterday — I think we're at about 10 inches, with more coming this morning. This is a picture of our backyard, taken from the back patio. 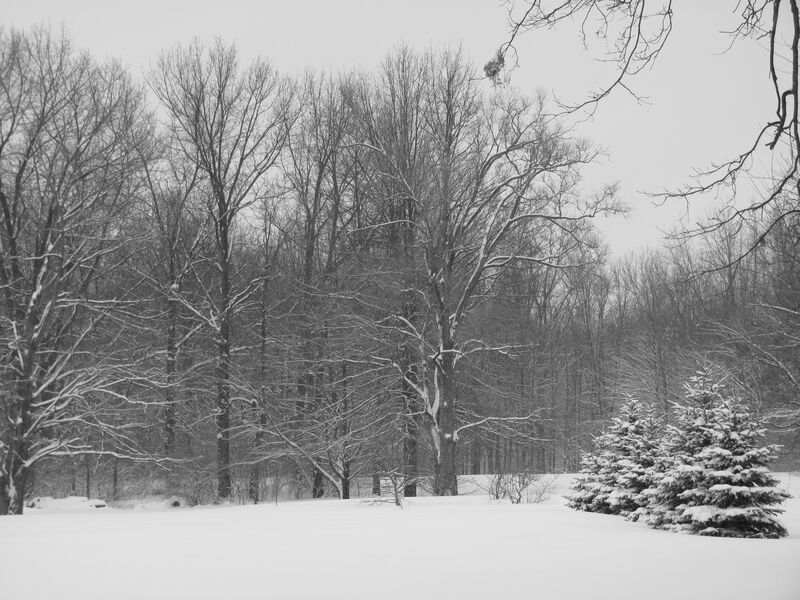 I love how our woods look with snow on the bare trees. The kids are thrilled to finally have snow days. I ran to the video store in the morning and stocked up on movies. Their day kind of went like this: Wii games, lunch, outside, movie & hot cocoa, outside, movie & popcorn, outside, dinner. Rough day, huh? I worked most of the day but did manage to whip up a yummy soup for lunch. I had some butternut squash just hanging out in my pantry so I stuck one in the oven to roast it while I was working. 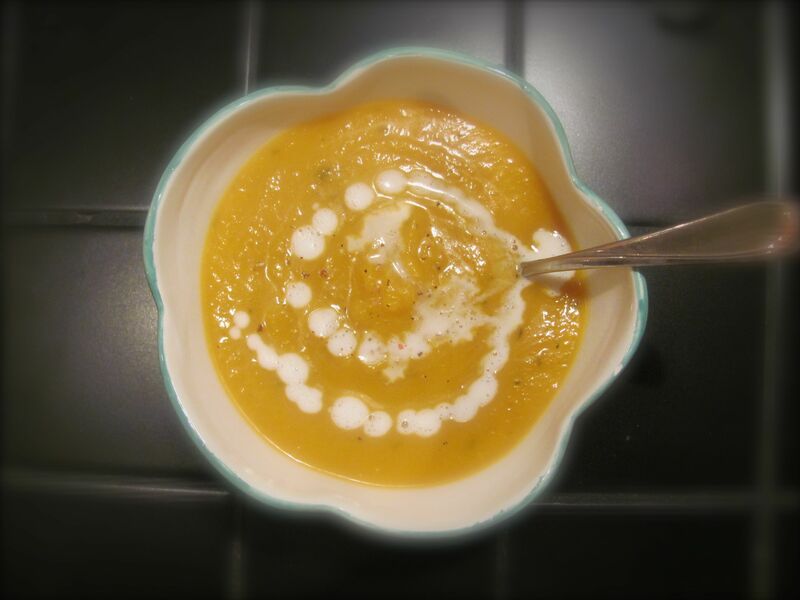 At lunchtime, I turned it into a delicious and very satisfying soup — especially on a snowy winter day. Here's the recipe. Interestingly, you can't even taste the coconut milk. But it made the soup really smooth and creamy. I like pureed soups to be thick, but if you want yours thinner, just use more vegetable broth. Heat oven to 350 degrees. Place whole squash on a baking sheet. Roast in oven about 1 hour or until soft. When cool enough to handle, cut in half lengthwise and scoop out seeds. In a large saucepan, heat olive oil over medium heat. Add garlic and onions and saute until soft. Scoop squash flesh into the saucepan. Add vegetable broth and thyme and stir. Allow to simmer for about 10 minutes for flavors to meld. In small batches, puree the soup in a blender or food processor and return to sauce pan. Stir in coconut milk and season with salt substitute and pepper. Drizzle a small amount of coconut milk on top. Serve hot. Enjoy!